The evening was unseasonably warm. The hour grew late. The fat, bone-white moon hung overhead…pregnant with a sense of ominous foreboding. We did not heed the signs. We were not prepared. It all began harmlessly enough. A group of foolhardy compatriots gathering under starlight to sample a selection of fermented treasures. There were rich, redolent barleywines. Bracing, bitter IPAs. Strong, complex Imperial Stouts. There was no hint of the terror to come. No indication of the foul, remorseless beast…biding its time. We talked of past glories and future plans and laughed loud into the night. At that moment, disarmed by the strong ales we had consumed and the convivial atmosphere, the beast chose the perfect moment to attack. It stood alone on the countertop…a pallid, pink sentry. A gaunt, dead man with hollow, black eyes and a rumpled top-hat he clearly stole from a murdered hobo stared out from the bottle. His fist was raised in the air in a salute both desultory and mocking. Behind him, a matrix of leaves and swine. Everything about the object screamed “WARNING: DO NOT TOUCH”…but we paid those claxons no mind. Three glasses were procured and the bottle was unsealed. A wisp of visible gas escaped from the top in the shape of a malevolent spirit. It winked at us once and then dissipated into nothingness. We did not take that as a good omen. We poured the liquid of the damned into our snifters and then sat back for a moment, reeling. The second the beer escaped its livid, pink confines, the world changed. The pale, white moon transformed into a blood-red disc. Three comically oversized vultures circled overhead…staring at us with lifeless, crimson eyes. A skeletal old man in priestly vestments rolled by in a cart pulled by a headless donkey. He pointed at us with one desiccated, bony finger and cackled…a sound like razorwire being pulled through a urethra. We chalked these events up to happenstance, naturally, and proceeded on our misguided errand. We held the glasses in our hands and breathed deep the tainted liquid’s aroma. Reader, I am not ashamed to admit that I descended into madness for a moment. The fetid, execrable scent of the potable hit my olfactory bulb like the devil’s own warhammer. Spoiled, rotten scents of maggot-infested ham, thin, over-sweetened maple syrup, and the charred, still-smoking bones of the innocent wafted forth from the glass. The tortured denizens of the 9th circle of Hell would have considered the aroma to be cruel and unusual punishment. Ah, but that odor was but a trifle compared to the taste. Ignoring all common sense and earthly reason, we sipped the oily flux. It ran roughshod across my tongue like the four horsemen of the apocalypse and tore through my innards like a rusty claymore. The taste was akin to being strapped to an ancient barber-surgeon’s table, having one’s mouth clamped open with iron vises, and allowing a gaoler to pour the liquified remains of long-dead pig fetuses, putrified breakfast table scraps, burning stinkweed, and the material manifestation of sin into one’s gullet. The moment the hellfire entered our mouths, we were changed men. Even after escaping the initial descent into lunacy, we knew we would never recapture our innocence or sanity. Even now, days after the event, I see things…indescribable things. There are moments when I feel I am in a waking nightmare. My world fills with the lurid pink of the bottle…and the cold, dead eyes of the mocking stranger with the hobo-hat appear in my peripheral vision. They dance just out of my line of sight as I hear the corpse-priest’s endless cackle. This is my reality now. Why, Rogue…why? Why have you foresaken all humanity and made a pact with evil incarnate? How could you produce an offering of such indescribably noxious qualities that it could make grown men want to tear out their own tongues? …it was a not a good beer is what I’m saying. Please don’t buy it. 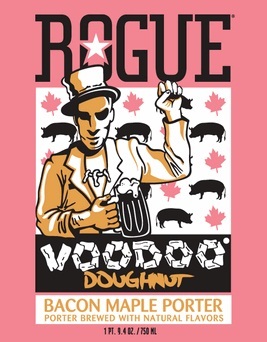 Posted in Tasting Notes.Tagged Bacon Maple Ale, Rogue, Voodoo Doughnut. Strangely, this “tasting note” only strengthens my resolve to try this beer. Even the fanboys on BA give this beer a 76. Keep in mind, people on the interwebs LOVE Rogue, so a 76 average is pretty damn poor. That’s like an F- for any other beer. Honestly, I don’t get all the hate heaped on Voodoo Doughnut. It wasn’t great and I wouldn’t buy it again; but it’s certainly not the madness inducing swill that people make it out to be. Wait…other people are claiming that the beer made them lose their grip on insanity? That’s awesome. I think the biggest problem is that this beer was poorly conceived from the start. Even if they executed it perfectly, it was probably never going to be a good beer. And they clearly did NOT execute it perfectly. Did the events described above actually happen? Of course not. The donkey totally had a head. Can’t be any worse than weyerbachers idiots drool, and probably cost alot less than the 35 bills they got me for. This beer tastes worse than Svetlana’s washing-water? I am disbelieving. Not gonna lie, it does taste like somebody juiced a burning pig and bottled it. It’s a pretty pungent beer. I expected maple with hints of bacon, I got chewing on a smoked chunk of fatback. Weird…..
We really should work the phrase “razorwire being pulled through a urethra” into all of our tasting notes.